Happy Valentine's Day! Let me start with a sweet image of a designer and his muse at the Fall 2017 show. Zang Toi always shows his love for his team, his models, the photographers and his guests. It is no surprise that he is a favorite, season after season. Toi's collections are the best in escapism. He takes his inspiration from an impeccably luxurious destination that we all fantasize about traveling to. This season he fell in love with the royal blue textile of the Ritz-Carlton in Berlin. It was a dark, intense hue that the designer knew he had to use well. Getting the shade wrong could be the difference between garish and elegant. As you see from the photos, he nailed elegance. 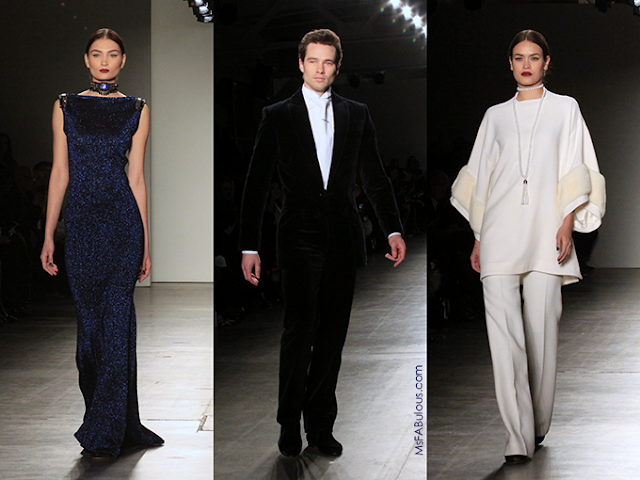 Zang Toi uses the most luxurious of fabrics. This season included baby angora, Lori Piana cashmere, silks of all textures and rich velvet. He paired full cropped cocoon jackets and wrap with slim column dresses for a striking silhouette. Gigantic ballgown and capes swept down the runway to make the photographers' riser swoon. The day wear included many a sophisticated ensemble that looked slim and draped. For the jewelry, beaded tassels and jeweled updates on the choker were beautiful. The hair was swept back into an elegant, simple bun on most models. I love this designer and show much, that partner Mdivani and I actually camped out for 4 hours in then riser to make sure we got the best view. Zang Toi's Fall 2017 was absolutely worth it.